When the mummified hand was given to Brien Foerster, he passed it onto medical experts for an evaluation. They x-rayed the hand and concluded that it was made of skin and bone, with no less than six bones in each finger. This proves that it doesn’t belong to a human, because humans only have three bones in each finger. This finding is the strongest suggestion that the hand is not a fake. This isn’t some regular old mummified hand they found. For starters it only has three fingers, and they are 8 inches long! What human do you know who has hands like that? There are many birds and reptiles that only have three fingers, but researchers believe the mummified hand doesn’t belong to any of those because it has fingernails. If it’s not an animal hand, nor a human hand, then it belongs to an otherworldly species. Along with the bizarre mummified hand, the Peruvian man also allegedly found an elongated infant-sized skull in a sarcophagus and its tiny mummified body. According to the medical examiner, they don’t belong to a human either. These inexplicable artifacts have been sent for DNA testing. The mummified objects have allegedly been sent to a lab in the US for DNA testing, which some people are skeptical about because of Brien Foerster’s involvement. Apparently he concluded that a collection of elongated Paracus skulls did not have human DNA, but was vague with his information sources. As of publication, the results of this DNA test haven’t been revealed; when they are, they will likely show the same results. If you find something weird and ancient while on a worldly adventure, Brien Foerster is apparently the guy to give it to. In this instance, he claims to have been given the mummified artifacts by a group of cagers exploring the Peruvian desert tunnels. He identifies them as “a local person” on his website. He told the Inquisitr that the person did not want to sell it, but simply wanted to know what it was – clearly they aren’t the only one. According to Brien Foerster, the mummified remains were found in a Southeastern desert tunnel inside two clay-covered sarcophagi. There were no photographs taken of the tunnel or sarcophagi, or the people who allegedly found it, leading many to believe the whole thing is a hoax. Foerster is convinced the samples are genuine, though. If the mummified remains don’t belong to any known species, the only alternative explanation is that this is an elaborate hoax. If so, a skilled person went to a lot of trouble to construct something made from real skin and bones! If it is a prop from a Hollywood movie, how did it end up in the desert? If you’re wondering who Brien Foerster is exactly, well, he runs Hidden Inca Tours, which allegedly investigates archeological sites. There is little information about him online, but he has written numerous books about his travels to ancient sites. There are also a series of YouTube videos about his findings, where he passionately explains his work. Apparently Brien Foerster has found strange artifacts before, like a winged corpse from Mexico he claimed must be an alien body. It was also constructed from skin and bones, so it’s either an anomaly or an elaborate hoax. People on the internet saw his video and suggested it was a ploy to make money, because it redirected to a website that asked for payment before viewing the whole documentary. On the website UFO Sightings Daily, Scott C. Waring alleges that the DNA results will be inconclusive. 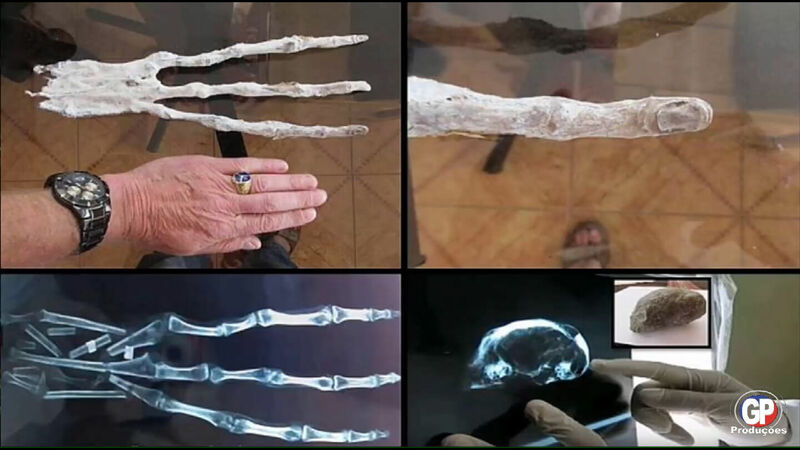 Since there is no scientific evidence of aliens there’s nothing to compare the mummified hand to: “Instead DNA results will only say that the DNA doesn’t match any known species.” There’s a section on his website where he claims that alien faces have been spotted in various remote corners of the earth, but the line between fact and fiction is rather blurry.